That's it, you have found your soul mate, and you want to ask her to marry. But now, you have absolutely no idea how to choose the engagement ring you will give her when you propose. Symbol of love and commitment, the engagement ring is an essential accessory to any marriage proposal. Diamond and white gold, emerald and platinum, sapphire and yellow gold, there is quite an ample choice! The question is how to choose the right ring that will please your loved one. This engagement ring buying guide should give you most of the answers. 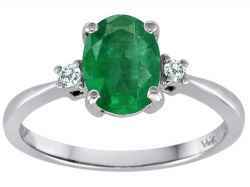 The type of gemstone that the ring will carry. The material the stone will be mounted on. Your maximum budget for the ring. The best way to present the ring to your partner. You should start by studying the style of jewelry your partner wears, paying special attention to the colors she favors: Does she mainly wear traditional or romantic pieces? Does she prefer more modern styles? Or, does she like to wear more subtle and practical jewelry? Equipped with this type of knowledge and the information provided in the guide below, you should be in a good position to choose the right engagement ring for your partner. For precious metals such as gold, the term refers to the number of parts out of 24 that are pure gold. A 24-carat (or 24K) gold ring is 100% pure gold, while a 18-carat (or 18K) gold ring contains 18 parts gold to 6 part of some other metal(s), and therefore is only 75% pure gold. For gemstones such as diamonds, the term represents a unit of mass equal to 0.00705 oz ( 200 mg). So, the larger the number, the bigger and more expensive the precious stone. Diamond has traditionally been the choice gemstone for engagement rings. Symbol of eternity and purity, it is most often mounted alone to be fully appreciated. The size of the stone, expressed in carats, the color, the clarity and the particular cut are the four factors (sometimes referred to as the 4-C's) that will determine the value of a diamond. The more a diamond is clear, the purer it is, and the fewer imperfections it has. The color of the stone is denoted by a letter that ranges from D (colorless) to Z (yellowish), a colorless diamond being the most appreciated. The cut of the diamond is also extremely important, as it has the greatest influence on a diamond's brilliance. A well cut diamond sparkles and is the work of an expert diamond cutter. The best diamond, if not well cut, will look dull and uninteresting. Diamond cutting is an art in itself. In an artfully-cut diamond, light enters the stone and is reflected around the mirror-like facets prior to leaving through the top. This delicate control of the movement of light within the stone and back to the eye is at the source of the stone's brilliance. 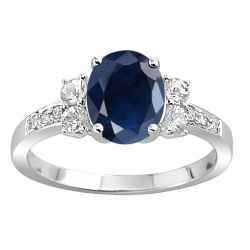 Sapphire is one of the most precious stones sold in the world. 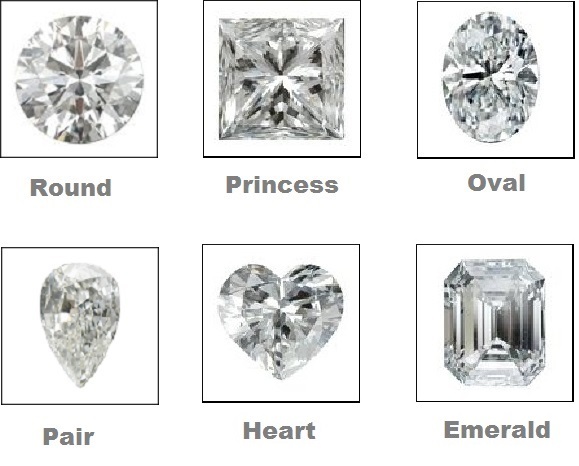 Cheaper than diamond, it symbolizes loyalty and sincerity. It would correspond more specifically to romantic and sentimental individuals. The bright red ruby is a symbol of passion, suiting therefore well passionate people. Finally, you can also opt for semi-precious stones such as the turquoise aquamarine or a cultured pearl, but these stones are certainly much less conventional. If your budget does not allow you to buy a diamond or other precious stones, you should know that there is an imitation stone of the diamond called cubic zirconia often incorrectly called cubic zirconium. When it comes to the metal used for the ring, the most common nowadays is gold. Symbol of purity and elegance, gold represents excellent value and is timeless. Pure gold, also called 24-carat (or 24K) gold is yellow and very malleable, making it too soft a material for a ring. To increase its hardness, it must be mixed with other metals. Thus, 18-carat gold is an alloy that contains 18 parts gold to 6 part of some other metal(s), and 14-carat (14K) gold contains 14 parts to 10 parts of other metal(s). By adding various alloys to the naturally yellow gold, other colors, such as white or pink, can be produced. Lately, white gold has become very popular. To produce white gold, it has to be treated with some other precious metal (usually rhodium). White gold makes the diamonds look brighter and more colorless as there is no yellow reflection from the ring. But yellow gold has always been a classic and stood for elegance and class. So, if your partner is young and modern, white gold may be more suitable. If she is older and more conservative, you may want to consider a yellow gold ring. But, there are really no exact rules here, and ultimately, since you know her better than anyone else, it will be up to you to choose the gold color that will suit her taste best. In the past, platinum, a grayish-white metal, more precious than gold, was also commonly used to make rings. Nowadays, it is chosen more rarely, but still used. Very pure and strong, platinum, symbol of eternity, is a very luxurious and expensive metal. A platinum ring will never tarnish and will maintain its appearance throughout its existence. Once purchased, it needs no further maintenance, unlike white gold which, being an alloy containing yellow gold, may tarnish over the years, and may require additional rhodium treatments to keep intact the perfect shiny white look. Rings made of titanium or steel are also beginning to emerge. These metals are cheaper but still very durable. For smaller budgets there is of course silver as well. 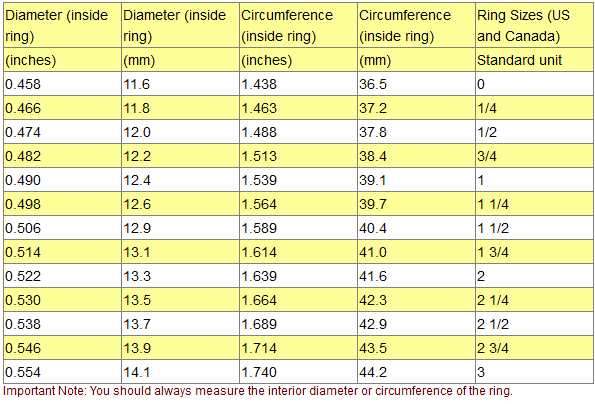 Choosing the ring setting type. The prong setting is the most popular setting of all, and usually consists of a solitaire gemstone set within a number of prongs (or short, thick wires). The number of prongs may vary between two and six, but in all cases the goal is to secure the stone well in place while allowing maximum light exposure. With the bezel setting, which is the second most popular, a metal collar crafted around the stone holds it in place. The bezel setting is usually considered more secure than the prong, but on the other hand, unless very well crafted, it exposes less of the gemstone to light, reducing the sparkle. In the channel setting, a number of smaller stones are placed in a row into one or more narrow metal channels carved around the ring. This configuration is often used together with a larger solitaire gemstone (see picture below) to enhance its presence. 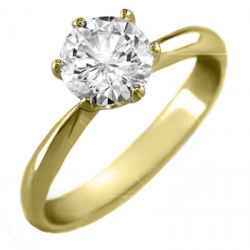 Budget side, it can cost anywhere from 300 to 500 dollars for a gold engagement ring with a small diamond of 0.10 carat. The price may be much higher with larger and purer stones, specially if they are mounted on platinum! However, one can find huge discounts when shopping online on Amazon. Ask someone close to her (a relative or a friend) to get the ring size information from her without letting her know the real reason of the query. If you have access to her things, take temporarily and without her knowledge one of the rings she usually wears and measure it. If you have no access to her rings, you could ask one of her relatives to get the ring for you. Finally, if the surprise element is not important for you, then you could get directly from her the ring size information, or ask her to lend you temporarily one of her rings. That way you would be avoiding any errors. Tradition dictates wearing the engagement ring on the left ring finger, the same finger as the alliance until marriage. So choose a correct ring, worn on the left ring finger, as a model. 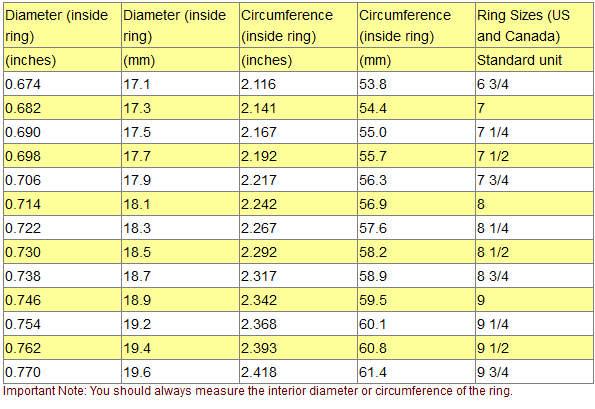 You should always measure the interior diameter or interior circumference of the ring. Measure 3 times to eliminate incorrect readings. 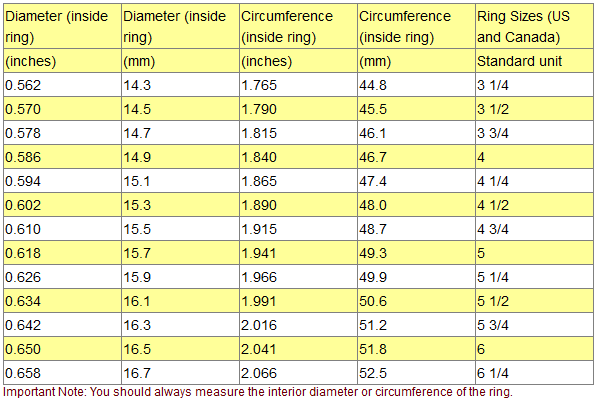 Note that the average woman's ring size is about 6 while the average man's ring size is about 10. 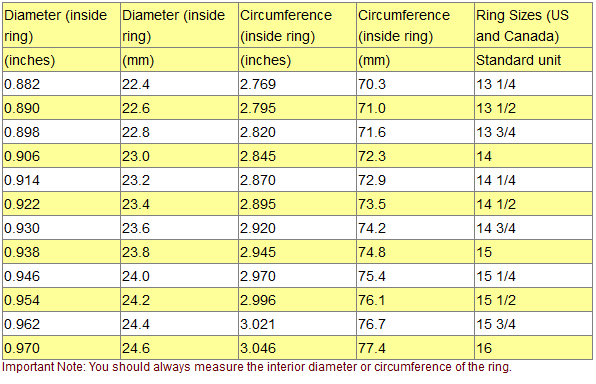 The conversion tables found at the end of this article provide the North American ring sizes that correspond to measured ring diameter and circumference lengths. There are dozens of ways to offer an engagement ring to your beloved: They range from the classic romantic dinner for two to the wackiest of all: proposing just before parachute jumping! But some prefer to bring together members of both families, even some friends, to celebrate the engagement, and they expect to propose in front of the intimate gathering. For a memorable experience both for your partner and yourself, you could also take your partner on vacation to an unusual but romantic place and propose there. Why not on an exotic beach, or facing a stunning view on a mountain top? The possibilities are as limitless as your imagination! In any case, your partner will be extremely happy to be offered the ring, a romantic gift par excellence, and she might even blush with pleasure. An engagement ring buying guide can not be complete, without specifying where to find the best choice of rings as well as the best prices: Amazon has a huge section reserved to engagement and wedding rings. Literally hundreds of rings of all varieties of gemstones, metals, colors, designs and prices are available to choose from. But the best thing about Amazon is the peace of mind that also comes with your purchase: if you are not completely satisfied, you can return any order for refund or exchange within 30 days from the date of shipment. To buy rings on Amazon, you can proceed to the next section below which gives you direct access to the ﻿Amazon Engagement & Wedding Rings Online Store﻿. There, you can literally search for the best ring for your partner using various search parameters. If any of them looks appealing, just click the corresponding ring image for more information. 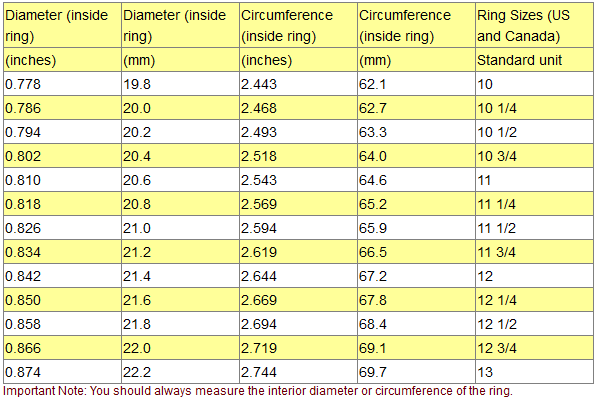 Make sure you read well the ring description to make sure that it corresponds to what you are looking for. To purchase the ring you just need to specify the ring size on the Amazon sales page. Diamonds purchased on Amazon may be certified by the Gemological Institute of America (GIA) or the International Gemological Institute (IGI). In most cases, the type of certificate provided will be specified in the product specifications of your jewelry purchase. Note: Amazon often provides a good discount on the List Price of sold products. If a discount is available, the List Price and the actual Amazon price will be shown when you click the product link images. You will note that most of the rings sold on Amazon come with huge discounts with respect to their list prices. If you are not completely satisfied, you can return any order for refund or exchange within 30 days from the date of shipment - You can shop with confidence on Amazon!